The State Highway Administration is in the process of expanding its fleet of freeway work zone speed cameras and there has seen a steep rise in the number of citations issued. So far the state has issued 118,500 citations from four locations. One single camera, located on I-695 at Charles street has so far issued 58,080 citations, primarily because the speed limit at that location has been lowered to 50mph. 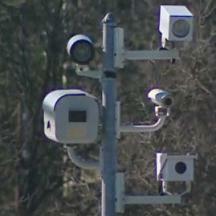 A new freeway camera, located on Route 15 at Hayward Road, is going up this week. The speed limit at that site has been lowered by 10mph in the southbound direction so that cameras can issue citations at just 2mph over the previous 55mph speed limit "Regardless of whether workers are present" under the terms of state law. In a videotaped town council session one Frederick City council woman quipped that this camera would "probably pay for the whole project". The SHA reported to the Towson Times that data on reductions in accidents, if any, was "not available" at this time. They nevertheless claimed that cameras are a success because "Statistics gathered from other automated speed enforcement locations are proving that drivers are slowing down as much as 5 to 7 mph through some of our work zones". However this reported slowdown could be entirely attributable to the use of speed trailers ("Your Speed" signs) which are currently deployed at these work zones. There have been many studies showing that such display signs are highly effective at reducing average speeds in locations such as work zones and school zones, including one by the Texas Transportation Institute showing average speed reductions of over 5mph from cameras. In fact the Maryland SHA was well aware of this fact when they made their claim, because in 2005 the Maryland SHA conducted their own study which showed speed trailers (without speed cameras) reduced average speeds in work zones by up to 7mph. However the SHA made no mention of this fact when they quoted their statistics on speed cameras to the press. There is no legal requirement that speed trailers be used at speed cameras sites, and they are NOT a standard fixture at most work zones without speed cameras. As such their use at speed camera sites could easily be a 'special introductory offer' which ends at any time... say sometime after November 2nd.